Over the last twenty years, we have seen the emergence of a major trend in North America: employee health and wellness are suffering. Less than one third of American employees (28 percent) say their overall health is "excellent", a significant decline of 6 percent since 2002 (Families and Work Institute). In Canada and the United States, there have been alarming increases of hypertension, diabetes and obesity over the last number of years. Between 1994 and 2005, the rates of arterial hypertension among Canadians increased by 77 percent, diabetes by 45 percent and obesity by 18 percent, affecting people of every age. Even more concerning: hypertension rates among Canadians aged 35 to 49 rose 127 percent during the same period, and almost doubled among young people over the last 15 years (CBC News). The long-term effects of these issues will be dire; for the first time in decades, life expectancy has decreased in the United States, according to a study published in December 2010. For employers, all of these factors should be very worrisome, especially since research shows that employee health directly impacts work behavior, attendance, on-the-job performance and of course, healthcare costs. In fact, 76 percent of American businesses report healthcare cost increases of as much as 10 percent year-over-year. According to the 2010 Healthcare Cost Survey by the firm Towers Watson, employers are now paying 28 percent more for health care than they did just five years ago, and employees are paying 40 percent more. This growth in health costs is far outpacing wage growth, but it doesn't have to be this way. A serious challenge faced by businesses today is a high turnover of qualified, motivated and loyal workers. Many employers are failing to support and sustain their best people and create trusting relationships with their best employees. The evidence: according to a report by TLNT, 74 percent of workers are passive job seekers ready to consider a move. In today's competitive markets, employers must find new ways to attract and retain the best and brightest talent. One way to do this is to offer employees an environment that promotes healthy and active lifestyles. Many of our health problems in Canada and the United States are due to the aging population, but this is far from being the only factor. "Seventy-five percent of healthcare costs result from unhealthy lifestyles," writes Barbara Schaefer, senior vice-president, human resources for Union Pacific Corporation, in her article, "Long Train Running". In health matters, factors such as smoking, physical inactivity and poor eating habits are responsible for the vast majority of health risks and their associated costs. There is good news for employers however: these leading causes of illness are largely preventable. A 2007 study of more than 200,000 employees, conducted by the University of Michigan, determined that 61 percent of employees have 2 or less health risks, 28 percent have a moderate risk (3 to 4 risk factors) and that only 11 percent have an elevated risk (5 or more health risk factors). The study determined that a realistic expectation for reducing health risk factors would have employers saving $354 per employee, per year, for an organization of 1973 employees. These are savings that can add up quickly. Businesses today are left with no choice but to create a healthy workplace culture if they want to perform to their best potential. High performance companies such as SAS, Wegmans Food Markets and Google have understood the profound connection between employee health, productivity and insurance costs. According to a report by the SHRM Foundation, "more than 75 percent of high-performing companies regularly measure health and wellness as a viable component of their overall risk management strategy". A survey conducted by Towers Watson and the National Business Group on Health "found that 83 percent of companies have already revamped or expect to revamp their health care strategy within the next two years, up from 59 percent in 2009. This year, more employers (66 percent) plan to offer incentives for employees to complete a health risk appraisal, up from 61 percent in 2009. Also, 56 percent of employers now offer health coaches and 26 percent now offer on-site health centers." And it's working! The Public Health Agency of Canada reported that by implementing a physical activity program, Canada Life in Toronto improved productivity and reduced turnover and insurance costs while achieving a return on investment (ROI) of $6.85 per corporate dollar invested. A study conducted by the U.S. Centers for Disease Control found that "comprehensive worksite health programs focused on lifestyle behavior change have been shown to yield a $3 to $6 ROI for each dollar invested." According to a report by the Medisys Health Group, out of the Top 100 Employers in Canada, 77 have a structured wellness program in place and those who track the results generally find that their expectations are met or exceeded. The managers and HR directors of these Top 100 companies report that the benefits of workplace wellness programs include decreases in insurance costs, absenteeism, presenteeism and turnover rates; increases in productivity and recruitment; and improved creativity and overall motivation of the workforce. The most important questions still need to be answered: what makes a wellness program efficient and how do organizations implement them? To be efficient, a wellness program must be well structured, meaning the program is tied to the overall business objectives and the implementation process must include leaders from every division of the business. Moreover, it must have an organizing committee that includes members at all levels, from top management to entry-level employees. To truly be successful, staff members must adhere to the program and ultimately claim personal ownership of it. Corporate wellness programs should focus on the changing of poor health habits as a top challenge in order to maintain affordable benefits coverage. A successful wellness program will help employees improve their physical health, will improve communication throughout the organization and improve the workplace culture. Quebec's Groupe de promotion pour la prevention en sante (GP2S) is an organization that has worked for a number of years to establish an ISO standard for workplace wellness. According to GP2S, there are a number of factors that will affect the success of wellness programs. Firstly, commitment must come from top management; the leaders of the company must be convinced of the value of the endeavour and must lead by example. Secondly, the program should be structured and integrated; managers need to define a comprehensive wellness strategy that is integrated to the business strategy, with a budget, timeline and thorough planning of resources. Third, the objectives of the program must be linked to the business objectives and the needs of employees, meaning that the program must be well integrated into the management system.GP2S also emphasizes the importance of effective communication. As stated in the Harvard Business Review's article, "The Pillars of an Effective Workplace Wellness Program", "Wellness is not just a mission it's a message. How you deliver it can make all the difference. Sensitivity, creativity and media diversity are the cornerstones of a successful communications strategy." Backing up the launch of a wellness program with a strong marketing and communication strategy prevents employee cynicism and skepticism and builds employee enthusiasm and excitement. 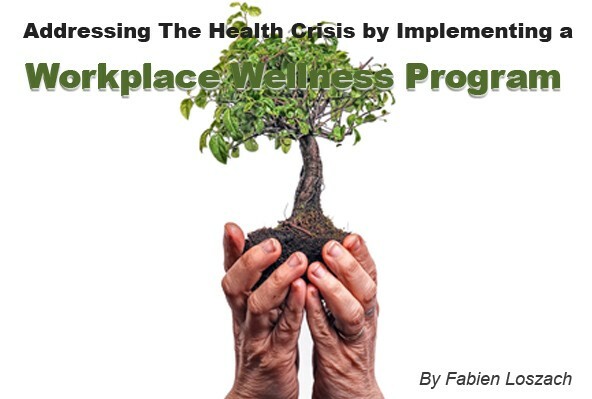 There is one very critical action that must be taken to ensure that a wellness program achieves a return on investment; the entire implementation process should be based on a detailed diagnostic that evaluates the global health of the business and the health risk factors of the employees. Conducting a diagnostic to uncover employee needs and find out the most common health risk behaviours allows companies to invest in real problems, which drastically improves the potential return of the wellness program. Finally, the program must be supported by an adequate budget. Employers, entrepreneurs and human resources managers must understand that when it comes to health and wellness, they must invest now to save later. Fabien Loszach is a visionary sociologist and co-owner of Loszach Report, the provider of an innovative workplace wellness diagnostic. Employers use the Loszach Report which includes detailed results, innovative solutions and a customized catalogue of the best wellness vendors to improve productivity, reduce absenteeism and minimize their insurance costs.